Blue, Black, and Gold 'HWPD', 'Patrol', and Unit '6' on sides and hood. Blue Hot Wheels Police Dept on hood. Hot Wheels logo on rear fenders. 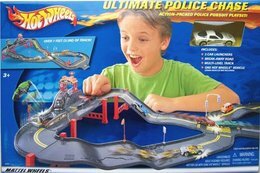 Ultimate Police Chase Boxed Playset.